The questions comes in light of a UCI rule, which was introduced this year. The full rule, which can be found here, reads.. 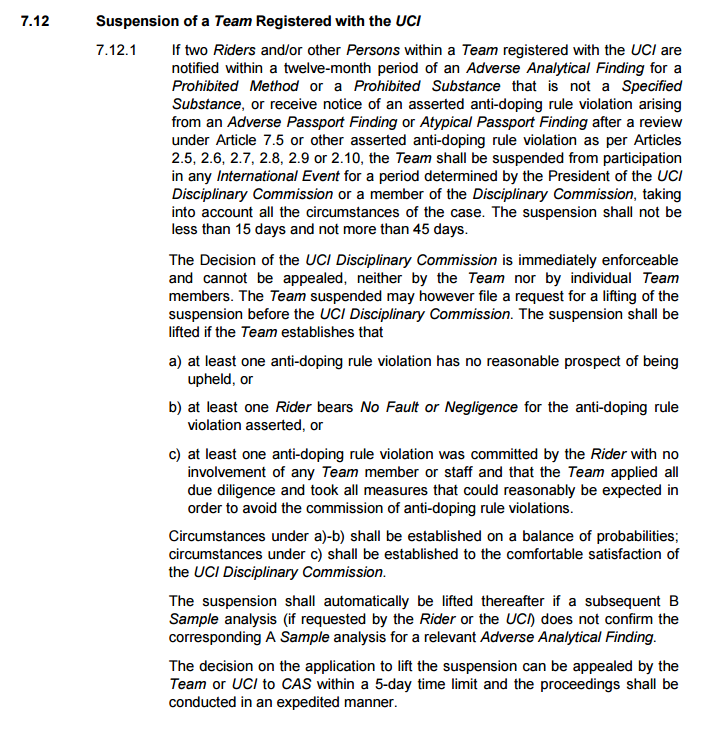 In short, two adverse analytical findings (AAF) from riders or staff on the same team means that the team is collectively punished with a racing ban of between 15 and 45 days. “Notified within a twelve-month period” is important here – the two AAFs don’t necessarily have to come within the same twelve months, so long as the team are notified of them within the same twelve months. This is the rule that has seen Italian ProContinental team Androni Giocattoli-Sidermec sit out thirty days of racing after the positive tests of Davide Appollonio (EPO on June 14) and Fabio Taborre (FG-4592 on June 21). Things are different for Katusha though. Even though notification of both positive tests came within a twelve-month period, the fact that Caruso’s positive dates back to 2012 means that a different set of rules apply. Both the UCI’s rules and the WADA Code (both 25.2) invoke the principle of ‘lex mitior’ – a legal term which means that in cases where a law has been changed, the more lenient of the two will be applied. In this case, the 2012 regulations apply, given that the rule which saw Androni Giocattoli-Sidermec banned was only introduced at the start of this year. So Katusha will race on, though their Italian contigent is rapidly diminishing. The team called the news of Caruso’s positive a “complete shock”. It’s hard to know exactly how to take this, given that the Russian squad employs Massimo Besnati (worked alongside Ferrari and Ibarguren in the past, was prosecuted for steroid possession in 2001) and Andrei Mikhailov (a convicted criminal thanks to his time at TVM) as doctors. Are they shocked Caruso was doping, or that he was caught?